Back in August, Diana’s mom was doing well enough that we thought we could possibly spend the winter in Florida. 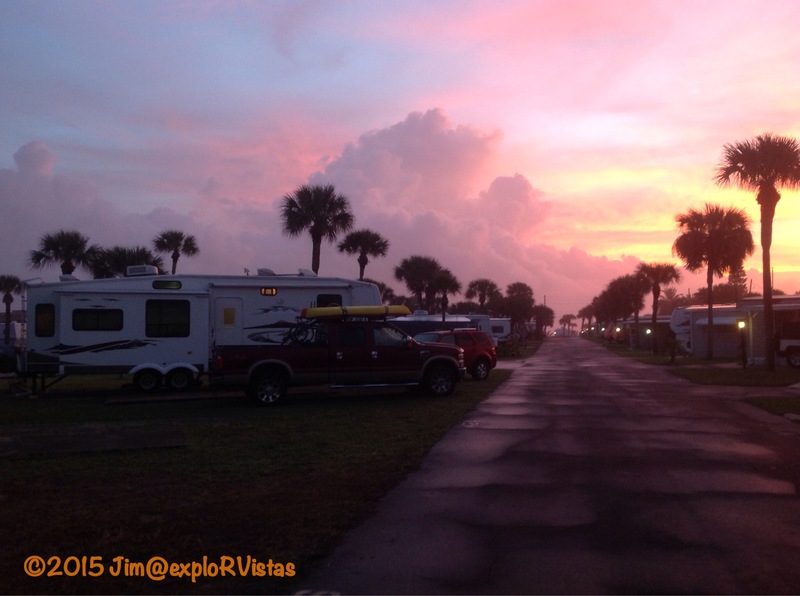 We put a deposit down on a campground in Malabar, Florida. We also purchased two round trip tickets for Diana to fly back and tend to her mom every few weeks. As time wore on, we realized that Mom’s deteriorating condition would require us to stay, so we planned on spending the winter in Michigan. A special thank you to Southwest Airlines for refunding those non-refundable tickets! When her mom passed December 1, there was no longer a need to remain in Michigan. Our friends from Wild Cherry, Rod and Mary, have a home in Melbourne Beach, just across the Indian River from Malabar. Rod had spotted a place he thought we would like better, right on the beach. Problem was, they didn’t take reservations! Well, knowing we had a place in Malabar definitely helped, so we made a dash to get here, in hopes that they still had a spot for us. They did indeed, and our new home for the next few months is Melbourne Beach Mobile Park! 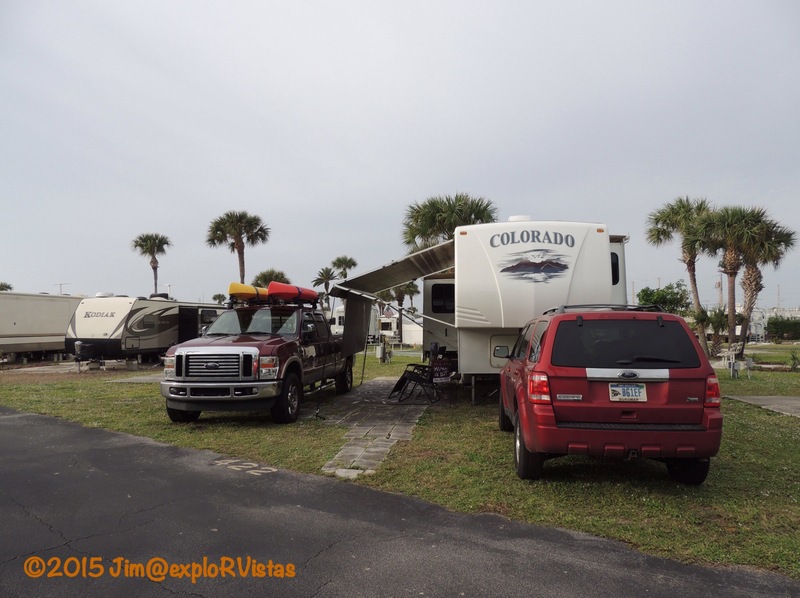 Our site is big enough for both of our vehicles; something that is fairly hard to find in Florida…especially near the beach. 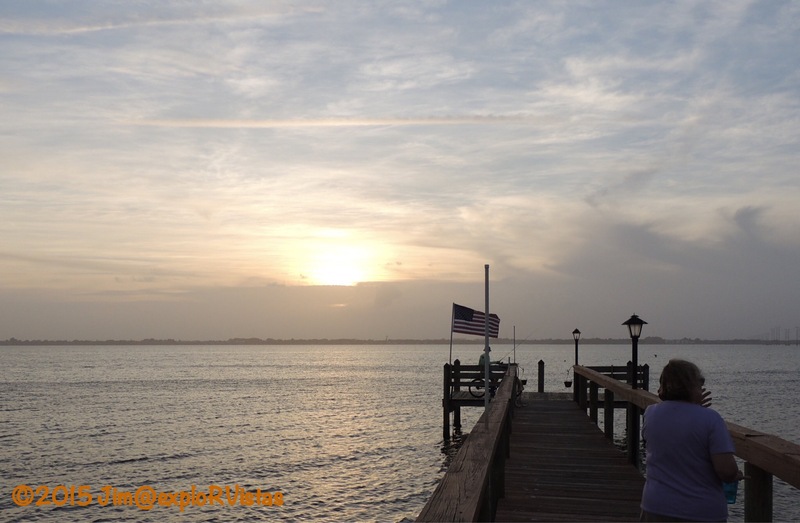 ……to the intercoastal waterway known as the Indian River. There is good fishing to be had off of their dock. 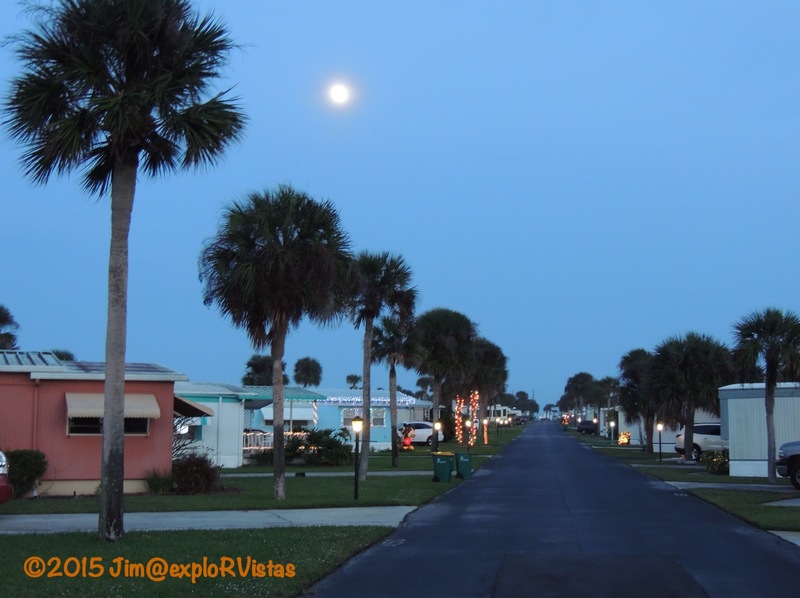 A1A, the famous coastal highway, divides the beach side of the park from the main portion of the property. 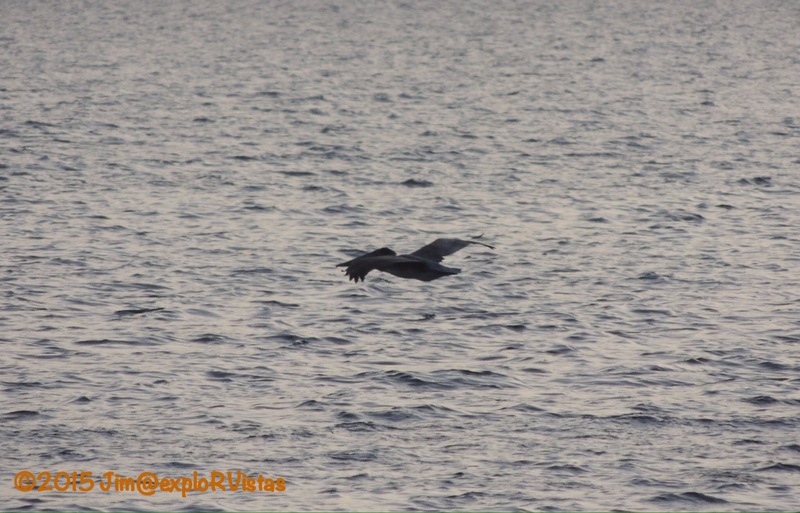 There are plenty of pelicans, cormorants, egrets and heron that frequent this side of the island. It is also a great place to watch a sunset. 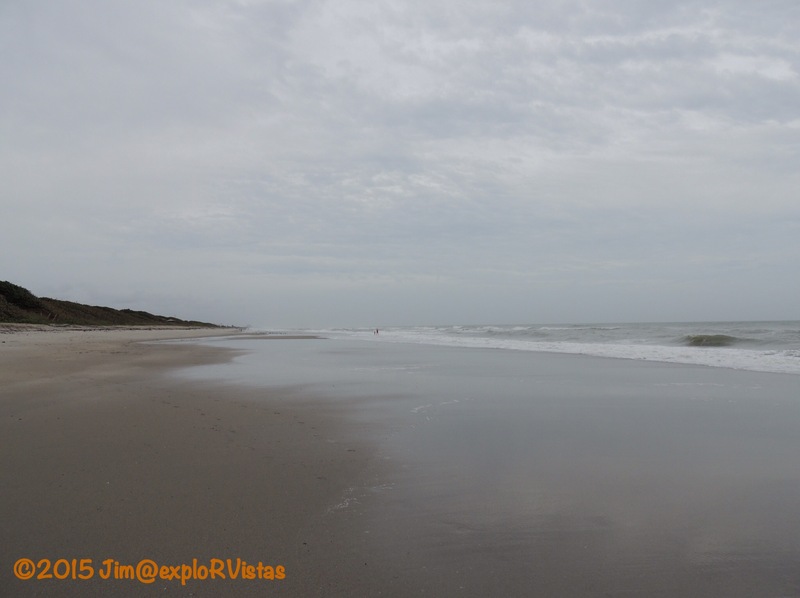 We took a walk to the ocean side of the park this morning and strolled the beach. The gentle slope of the sand reminded me a lot of Daytona. 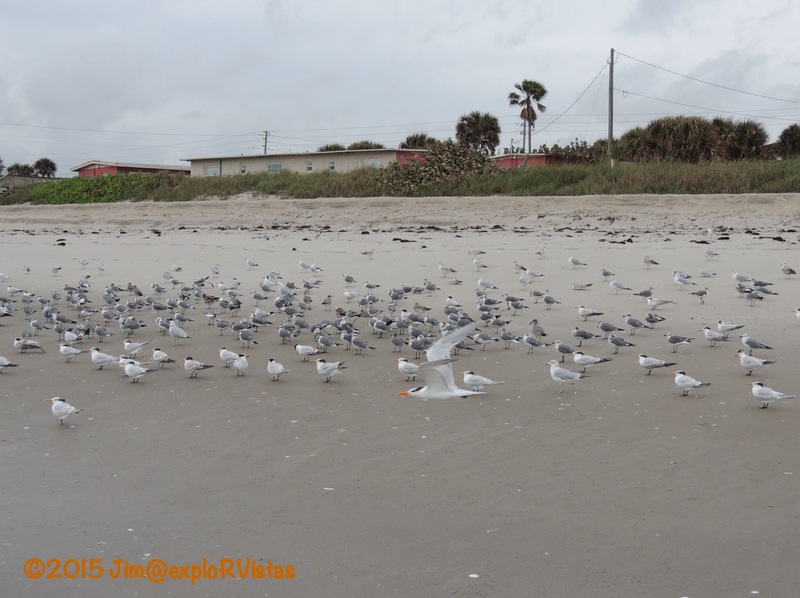 There was a sea bird convention going on along this portion of the beach. 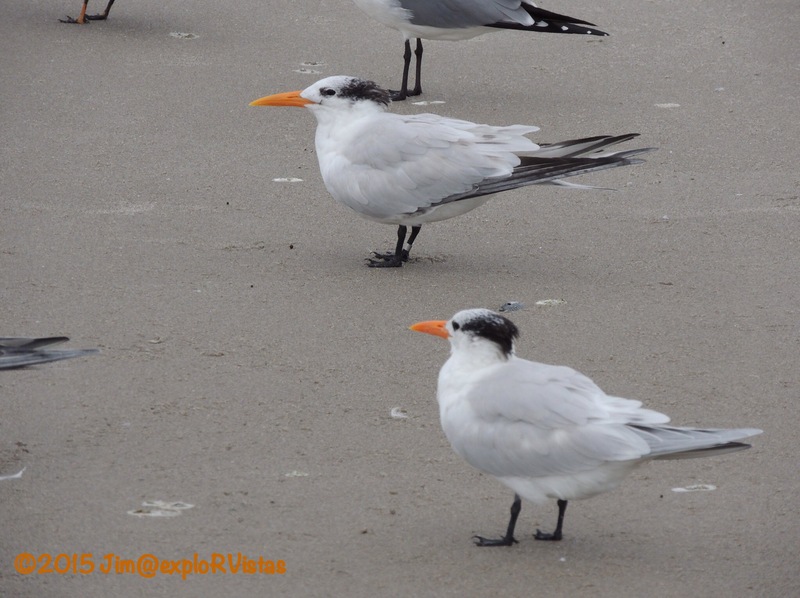 A good portion of these birds were Royal Terns. Diana also took a video of a group of Sanderlings that you can view here. They were very entertaining to watch! 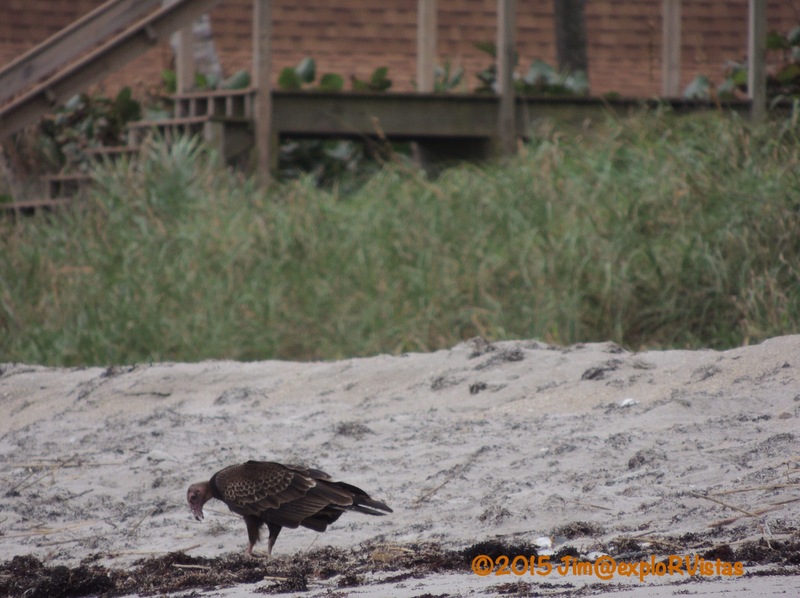 There were a few Turkey Vultures feeding on dead fish. 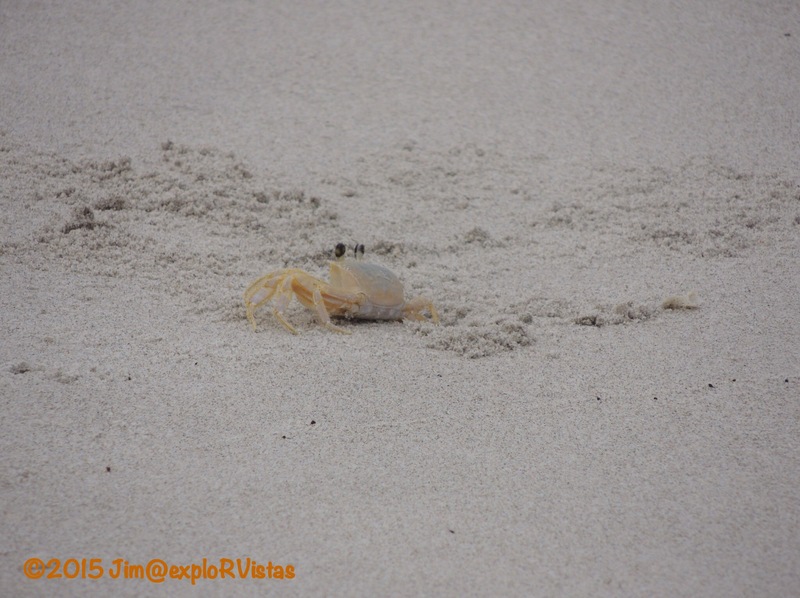 This Atlantic Ghost Crab popped out of its hole to pay us a visit. 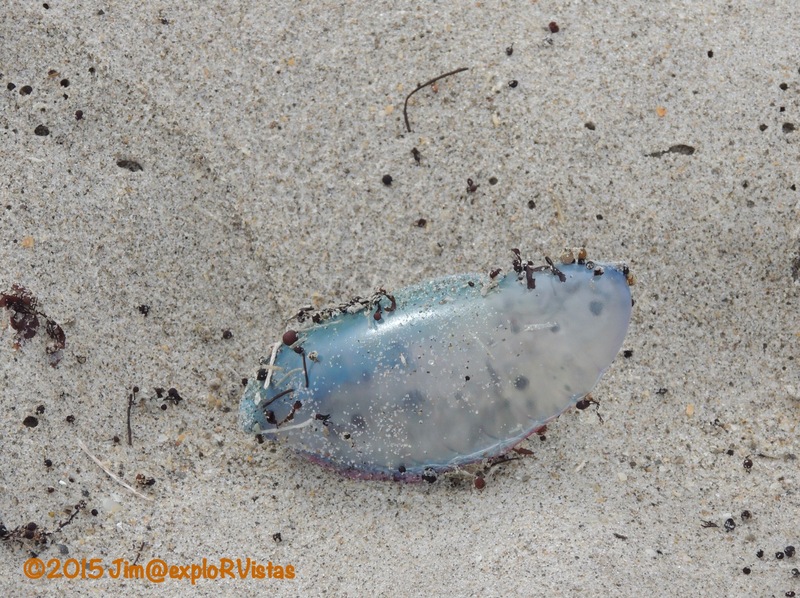 We saw several Portugese Man o’ War on the beach. Good reason to stay out of the water…and be very careful where you are walking! 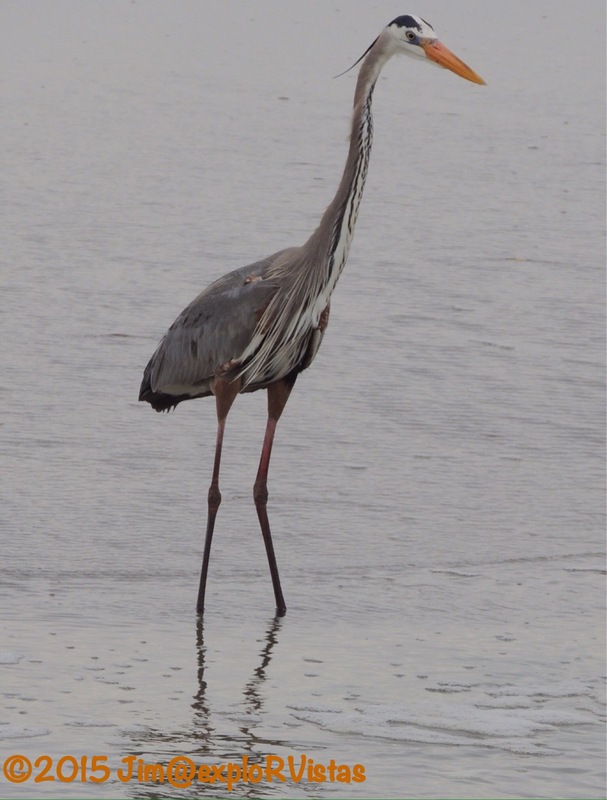 This Great Blue Heron was fishing in an eddy. We were able to walk within a few yards of it when we passed by. explorRVistas is a participant in the Amazon Services LLC Associates Program, an affiliate advertising program designed to provide a means for sites to earn advertising fees by advertising and linking to amazon. com. Do you worry about salt water damage to your vehicles being so close to the ocean for several months? Well there definitely is that concern. They have a separate water supply (well water) to rinse your vehicles down. There is a car wash just up the street for the Escape. We are so excited for you because we are excited too! Funny how things work out. We are also under palm trees but in the desert. Wishing we were near the ocean though. Have the best time ever! More will come. As long as it is warm, Kathrun! Those desert sunsets that everyone post look amazing! We do love the sound of the ocean. We can hear it from our rig, which is pretty neat. Great to see that you guy made it down there and are now relaxing. Enjoy the sunshine, it is well deserved! Thanks, Jim! Hope your holidays are great! Nothing better than being close to the water. Enjoy your winter. Merry Christmas! Thanks, Beth! Merry Christmas to you! I see why you were just a bookin’ it to get there. Looks nice. When we were pulling into Pensacola Beach yesterday I was thinking how much I don’t like being this close to sea level. All the time in Oregon and all the talk about tsunamis made me much more aware of the sea than I had ever been in my life. And driving through 6” of water on the road, and then being told our site was flooded but did we want another, kind of reminded me of the bad parts about being this close. But for us it’s only 11 nights. And I’m off to find a car wash today. Even a measly 160 mile tow was enough to make the car look like it’s never been washed. Have fun down there you two… We’ll be over to see you eventually. You guys have a great spot. Merry Christmas. Thanks, Allen! Merry Christmas to you and Donna! 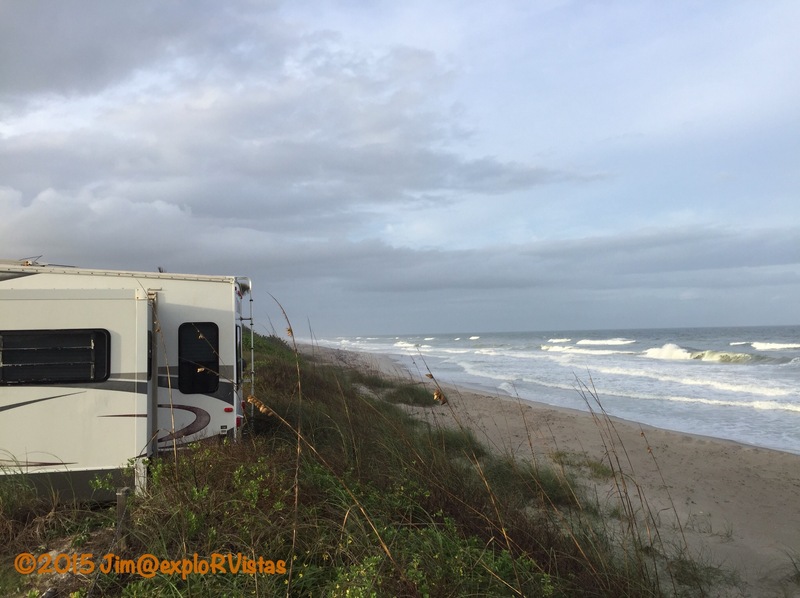 Good to see you made it safely and are all settled in a perfect spot:) Looks like you will have a couple very enjoyable winter months:) Nothing being close enough to the beach to head out whenever you want. Wishing you and Diana a Merry Florida Christmas! And a Merry Christmas to you, John and Pam! What a great find so late in the season – and right on the water! Love all the birds you’ve already seen, but that man o’war would definitely keep me out of the water! Merry Christmas to you both. We were lucky that Rod and Mary were able to scout for us, Jodee. They also turned us on to the Melbourne Beach Supermarket, which is a wonderful little neighborhood market that has more wine than groceries…but the food they do have is delightful! Oh, and Merry Christmas to you, Bill and Tessa!